What? You try finding 18 glasses in an office. After way, way too much tasting, it all comes down to this. OK. I just asked my co-workers if they wanted to drink beer on a Friday. Together, six of us sipped our way through a sorta-kinda blind taste test of our top three beers. The results were near unanimous. Let’s count ’em down. 3. When faced with solid competition, none of us could figure out how Red Racer had made it so far in the challenge. The hoppiest of the three beers, it garnered a less than enthused reaction in a room filled with IPA-deniers (my people, truly). This particular bottle seemed to have a slightly grassy finish as well, which didn’t sit well with the pumpkin. “Not my style of beer” was about the nicest comment, with several panellists saying they didn’t enjoy the beer at all. 1. I had a feeling Phillips was going all the way the first time I tasted it. It’s bright, light qualities seemed to hook my co-workers (sans editor) too. “It’s a slam dunk,” said one, with another calling it the best-balanced between pumpkin and beer. While I’ve complained about the difficulties of innovating with pumpkin beer, Phillips is a bit of a different breed — light and not as sweet than many of its competitors while still maintaining both pumpkin and spice flavours. If you do prefer something darker, however, you won’t go wrong with Howe Sound. 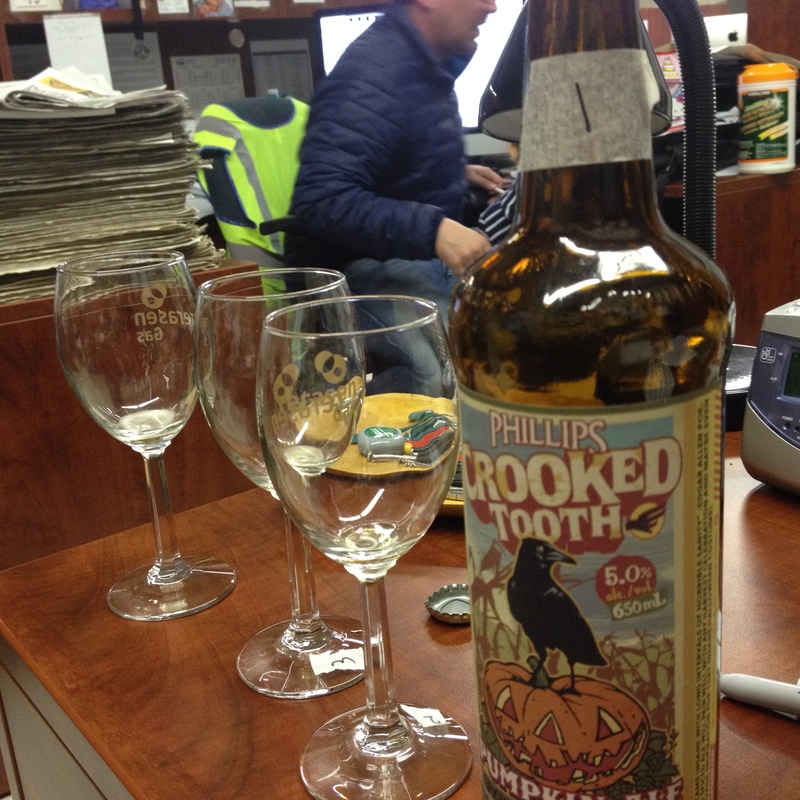 Personally, I knew where the win had to go as I was sneaking another glass while my co-workers made their tasting notes. The Crooked Tooth was gone before we’d finished tabulating the results. Posted in Beer. Tagged Central City Brewing, Howe Sound Brewing Co., Phillips Brewing, PUMPKINDROME. It’s the semifinal round of Bad Rider’s Pumpkindrome. So far, Phillip’s Crooked Tooth and Red Racer Spiced Pumpkin Ale are headed to our three-way finale showdown. 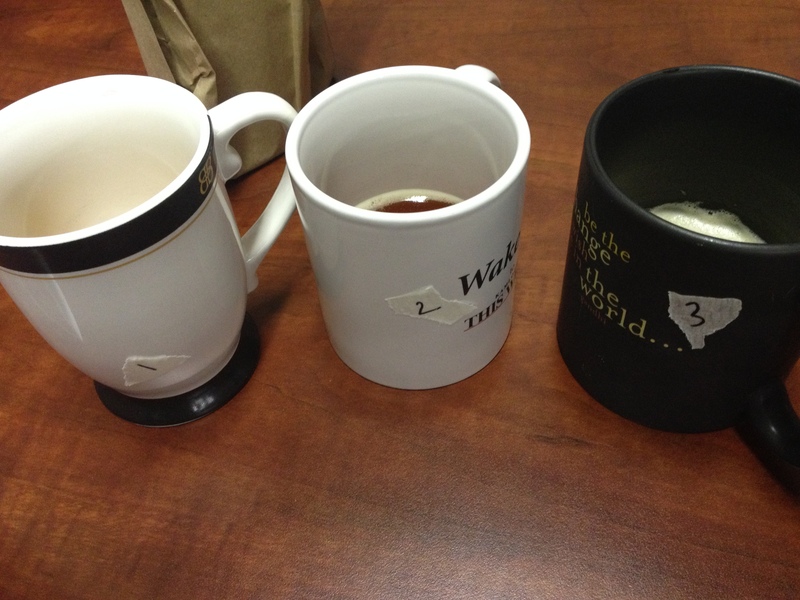 Which brew will be the last to join? 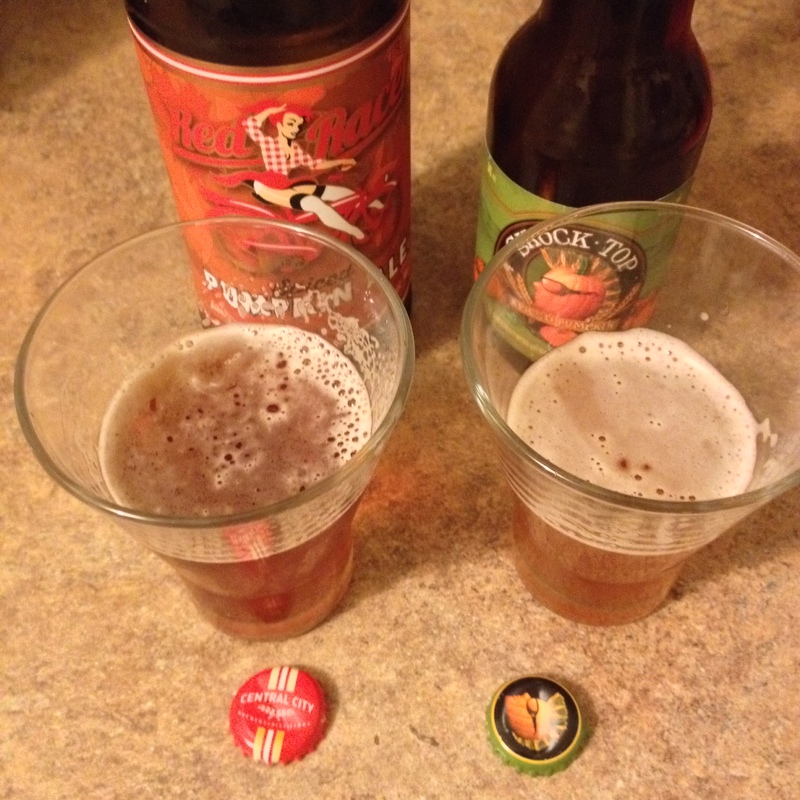 The Shock Top versus Red Racer debate came down to craft versus commerciality. Today’s Pumpkindrome semi-final, on the other hand, leaves us pondering a different question. What matters more in pumpkin spice beer — The spice? Or the pumpkin? There’s no denying Nelson’s pumpkin is some of the best flavour in the entire bracket, with a just-plucked-from-the-patch freshness. But, the spice in this organic ale is a one-note, almost chemical cinnamon. Pumpkineater’s pumpkin, meanwhile, is the least interesting thing about it. As I mentioned in round one, the notes of anise, ginger, clove and spices other brewers don’t take the risk on gives this ale a complexity that stays past the first sip, though they also make the squash flavours in the beer harder to locate. While I’ve tended to defer to beers that prioritize our round, orange friends — it’s not called the Pumpkindrome for nothing — this time around I have to go the other way in my pick. 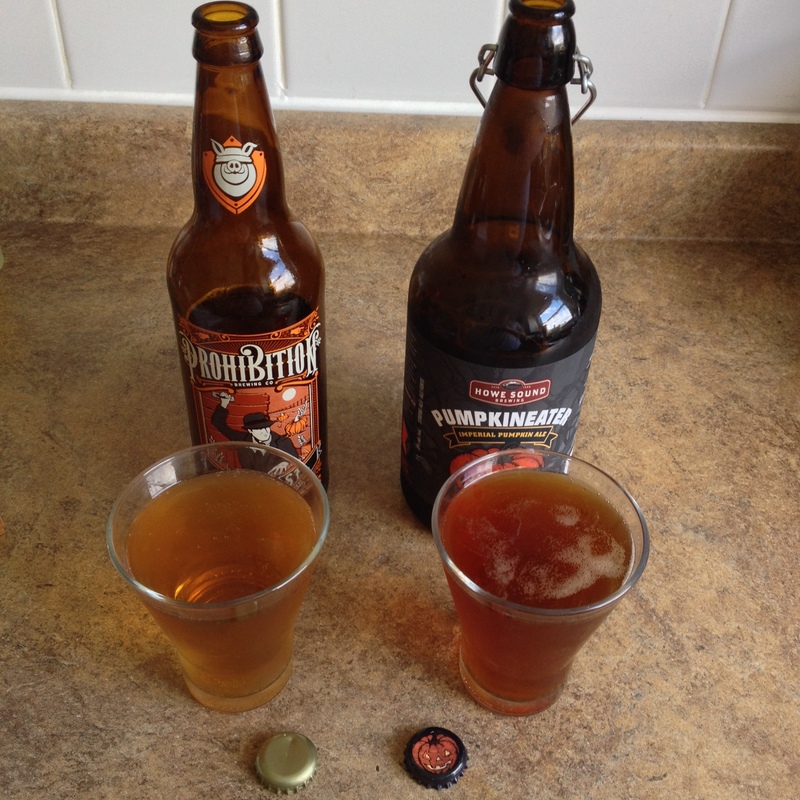 Pumpkineater was a fan favourite well before the pumpkin trend got off the ground in Canada, and it’s easy to see why it’s held its own among the upstart brews and challengers to the throne. Howe Sound simply makes a more interesting beer, one that held my attention beyond the first glass. Posted in Beer. Tagged Howe Sound Brewing Co., Nelson, PUMPKINDROME. It’s the semifinals of Bad Rider’s pumpkin battle, and it’s time to explain the rules for our next section. Since I never did track down the right number of beers for an even bracket (Kamloops was experiencing some weird beer stockage issues for much of early October, but that’s another, much whinier post), we’re headed into round two with five beers on the block. Thus, I’ve decided my favourite of the competition thus far gets a bye. So congratulations Phillip’s Crooked Tooth! You move to round three. Phillips was our first week winner and impressed me with its balanced mix of spices and pumpkin. I’m pretty sure it’s going to be a tough one to beat when we reach final three. As to the rest of our brews, best wishes and spices. I’ll be honest, this was over in a sip. As I mentioned last time, Shock Top is not my bag. Too thin, too chemical, way too sweet, it’s here in Round Two by the virtue of another beer’s failure. If you’re in the mood for a pumpkin beer and you have the choice between these two contenders? For the love of Good and beer, pick Red Racer. The craft option is only medium-sweet with a darker, more caramel edge to its sugar. It’s mild on the spices, as is Shock Top, and the pumpkin is a little one-dimensional compared to some beers in its class, but it’s a thoroughly solid pumpkin offering. I’d recommend it on mouthfeel alone, over Shock Top. Will it stand up to our other two finalists? That’s a question that’ll have to wait for the finals. Posted in Beer. Tagged Central City Brewing, corporate sellouts, Phillips Brewing, PUMPKINDROME. 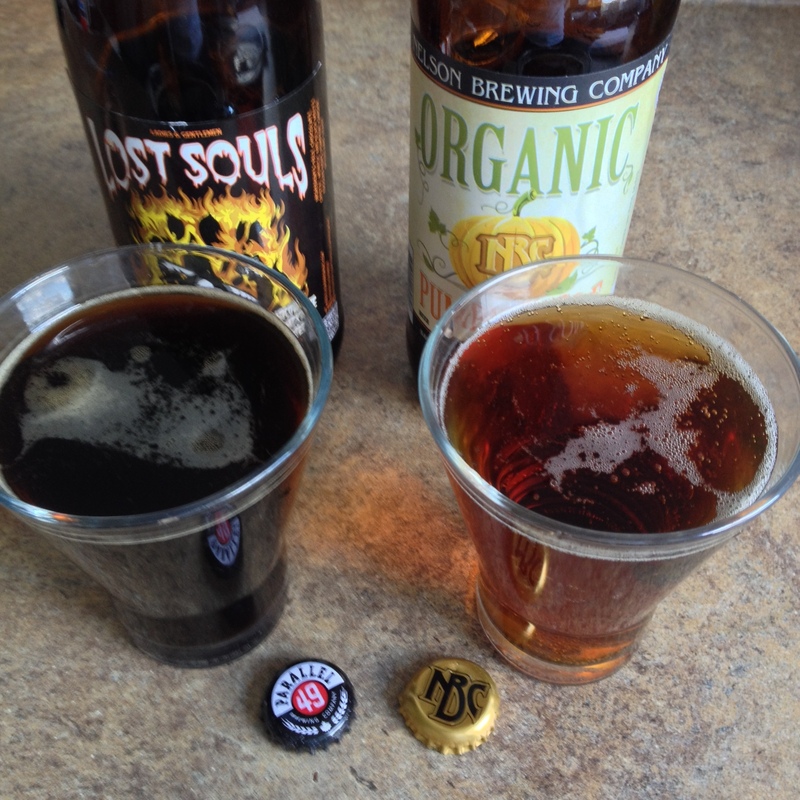 This October Bad Rider’s beer section is pitting gourd against gourd in a battle to determine which B.C. beer is king of the pumpkin patch. Welcome to Pumpkindrome. In case you haven’t guessed, Riders, what I’m saying is Shock Top Pumpkin is headed to round two. The thing to understand is this was Steamworks’ round to lose. Shock Top is high sweet, not much spice, but a pronounced and fairly realistic pumpkin taste. It’s not a bad beer, but every flavoured Shock Top offering makes me feel like I’m drinking alcopop and this is no exception. The sweetness is more pronounced, with a refined-white-sugar flavour. The mouthfeel is thinner. The flavours are more laboratory-crafted. All Steamworks had to do to triumph was give me some pumpkin and spice flavours, any of them, and I’d take its natural sweetness and smoother feel any day of the week. Instead, what I got is a beer that I would never have expected from that brewery. Typically, Steamworks beers are idiosyncratic. Lots of bold notes. Sometimes (oftentimes) too many bold notes for my tastes. If anything, I would have expected something too assertive. But this beer suffers from the same problem as many of the challengers — neither spice not pumpkin makes the appearance one expects. There is something there, a hint of cinnamon and nutmeg on the back of the sip. But it’s not enough to impress, and certainly not enough for round two. Anyway, if you need me I’m gonna crawl into a hole now and hide my snobby, snobby shame. Posted in Beer. Tagged corporate sellouts, deep shame, PUMPKINDROME, Steamworks Brewery. One of the more frustrating aspects of Pumpkindrome is that I feel like I’m penalizing innovation. 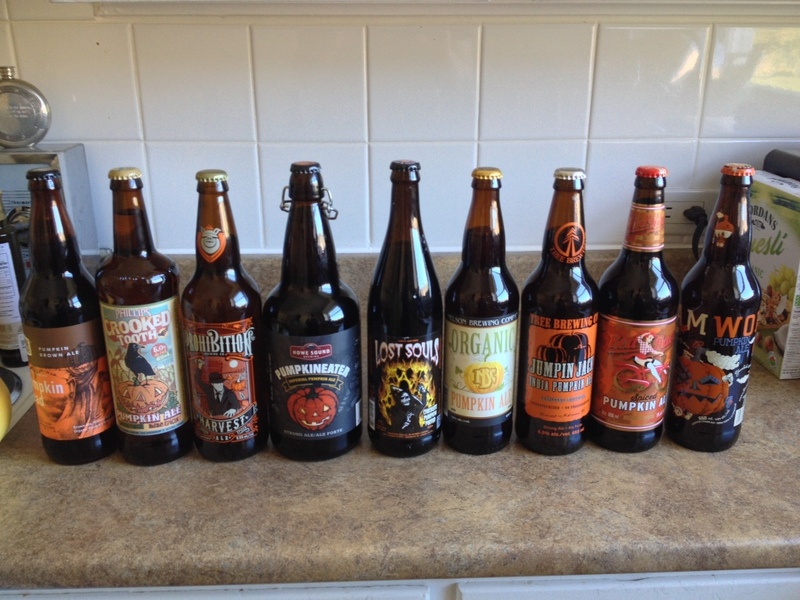 On the weekend, it was Parallel 49’s chocolate and pumpkin porter failing to make the cut. 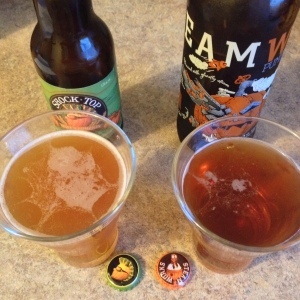 This week, I’m having similar struggles with Tree Brewing’s marriage of IPA and pumpkin. Here’s the problem, I think: pumpkin is not a particularly bold flavour. Add something strong, like IPA-appropriate concentrations of hops or chocolate, and you mask it. If you’re not amping up the spices to compensate, it doesn’t take much to lose any sense of your original purpose. Jumping Jack is a darn bold IPA, too. While I’ve somewhat come around on my no-way-IPA stance lately, thanks to some delicious brews (most notably Gigantic Brewing’s offering out of Portland), this is not my kind of IPA. Forget nuance, this is all hops — and hops in a concentration that makes me think soap, not beer. If there’s any pumpkin here, I can’t find it. Probably because I’m too busy wincing. 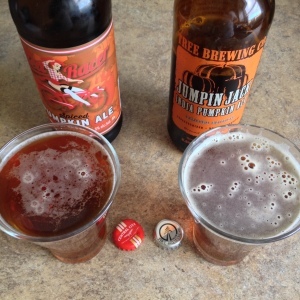 Red Racer’s take on pumpkin beer, meanwhile, is as textbook as you could find, from its pumpkin pie smell to its spice blend. Here, as with other contenders, it’s mainly a cinnamon effort, though there’s a sense of ginger and nutmeg in the blend as well. I’d call it mid-sweet, but it’s really pushing that definition. And while the pumpkin isn’t as well-developed as I’d like, it’s definitely there. It’s a perfectly good beer. Does exactly what it says on the label. And yet, I feel a bit bad that once again, I can’t give the risk-taker a bump. I’d love to taste a beer that marries IPA’s assertive hops with the pumpkin’s interesting, savoury freshness. Tree’s ain’t it. Red Racer’s onto round two. Posted in Beer. Tagged Central City Brewing, Kelowna, PUMPKINDROME, tree brewing co. They both have pumpkin in their names, but today’s Pumpkindrome challengers couldn’t be less alike if I’d tried, instead of leaving this bracket to random chance. And, more than any match up so far, this week’s decision is coming down to personal preference and slightly twisty logic. Parallel 49’s Lost Souls is on the low end of sweet, with a smooth, mostly chocolate taste — milk-chocolate, not dark. The chocolate’s balanced out with the sort of malty notes you’d expect from a beer of this style, and overall it’s a very cohesive drink. With a short of espresso dropped into your pint, you could drink this at brunch with absolutely no shame. Do you remember those little red cinnamon hearts from Valentine’s Days past? This beer doesn’t seem to have the spice balance of the other comers so far. It’s all cinnamon, and when combined with the beer’s moderate sweetness you end up with a finish that’s uncomfortably bulk bin candy. But, you ask, what about the pumpkin in Parallel 49’s beer? That’s where the issue comes in, dear drinkers. I couldn’t taste any. If I’m being generous, I thought there were some hints of cinnamon rounding out the chocolate. You could see this more in the line of a chocolate spice bread — delicious, but unlikely to make pumpkin much of a star. So while I think it’s well composed, very drinkable, and less discernibly flawed, I don’t think I can give Lost Souls the win. If I’d made it my only pumpkin purchase of the year, I’d be pretty disappointed, good as it is. Nelson’s uneven, but you can’t deny it’s pumpkin. It moves on to round two. Posted in Beer. Tagged Nelson Brewing Co., Parallel 49, PUMPKINDROME. This October Bad Rider’s beer section is pitting gourd against gourd in a battle to determine which B.C. beer is king of the pumpkin patch. Welcome to Pumpkindrome, Week Two. I took my first sip of Prohibition’s Harvest Pumpkin and went into a panic that the beer had somehow spoiled in my refrigerator. That about set the tone for this round. 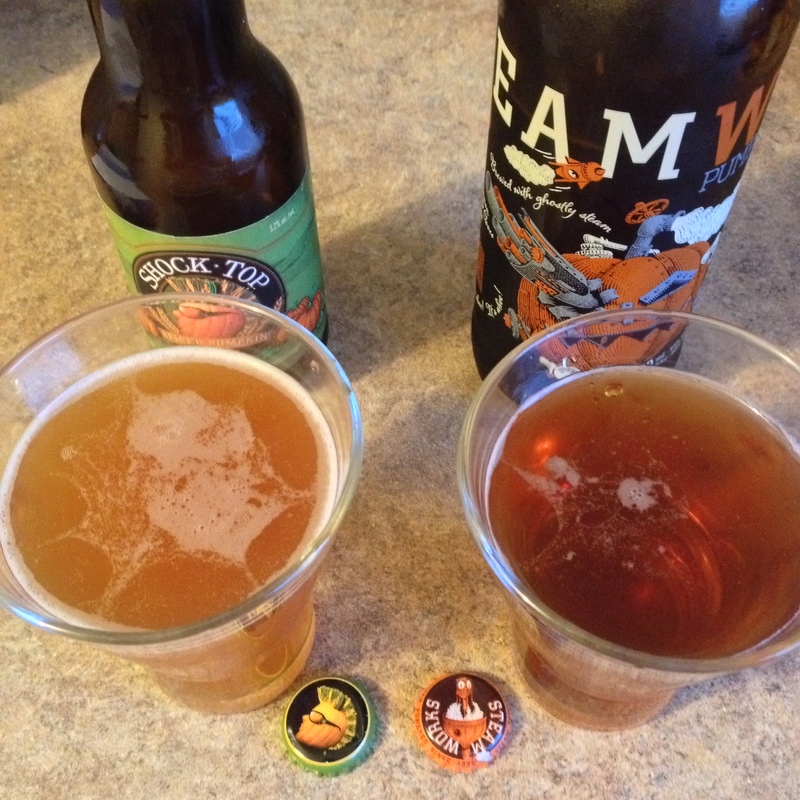 Compared to our last pumpkindrome outing, today’s beers appeared a little more in line with each other — both different degrees of the same orange-amber colour, both bubbly. But, one has a business being in this competition and one made me kinda sad. If someone served me a glass of Prohibition blind, with no up-front info, I might have guessed it was a pilsner having a very bad day. It’s got those sweet, corny notes and the mouthfeel I associate with pilsners but holy cats is it ever sharp. My first couple sips were overwhelmingly citric acid, and that never much died down. If there was either pumpkin or spice to be tasted under all that, I never managed it. Howe Sound, meanwhile, makes some interesting choices with their pumpkin offering. Specifically, I’m talking about the cloves and star anise in their brew — two unusual spices choices that come through fairly strongly in the beer. I also caught notes of the other usual pie spices, ginger in particular, but it’s that very subtle, fresh hint of liquorice and clove that I’ve always noticed most in Pumpkineater. With a number of unusual flavours and about a medium sweetness (not to mention that 8 per cent ABV), it’s the kind of beer the benefits from a slow drink to suss out all the complex flavours. while it’s a great spiced beer, I’m not sure it seems that pumpkin-like. While I got a whiff of pumpkin on the nose, there’s not much of it in the glass, and the spice mix doesn’t immediately make me think pie the way some of the others in Pumpkindrome have. It moves on to round two, but I’ll be curious to see how it stacks up to some of our other challengers in the days ahead. Posted in Beer. Tagged Howe Sound Brewing Co., Prohibition Brewing, PUMPKINDROME. This October Bad Rider’s beer section is pitting gourd against gourd in a battle to determine which B.C. beer is king of the pumpkin patch. Welcome to Pumpkindrome, Week One. We begin our epic showdown with a battle of light and dark, sweet and more-sweet, pumpkin and …wait, where’s the pumpkin? If Pumpkindrome were a battle of smell, Fernie would have the match after one whiff of the pint glass. With a moist pumpkin and spice aroma, Pumpkin Head smells like a slice of pie that’s been lingering on in the fridge a couple days past Canadian Thanksgiving. 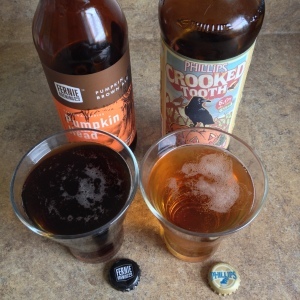 Crooked tooth, meanwhile, offers a light nutmeggy scent, but none of the pumpkin funk. But, when it comes to flavour, Fernie’s offering can’t make up to its pre-sip hype. Where I was hoping for notes of cinnamon, allspice and sweet, cooked pumpkin, all this dark beer had to offer me was sugar. To its credit, it was a rich, brown-sugar, fall-style sweetness — seasonally appropriate, at least. And as far as brown ales go, if you like your brew mid- to very-sweet, you’ll find nothing to complain about here. You just won’t find any pumpkin. Phillips, on the flip side, offered me a taste quite like what I would have expected from Fernie, based on smell. Crooked tooth is a pure slice of pumpkin pie, with a slightly sweet pumpkin custard flavour and mellow spicing. While the Phillips website claims ginger, cinnamon and nutmeg in the brew, it’s the latter I noticed most, which actually seemed to work quite well. While your standard pumpkin spice fare can get abrasive and heavy from cloves and cinnamon, a light touch of nutmeg adds some depth to the sweetness without overwhelming the pumpkin. This time around, it’s no trouble to pick a winner. 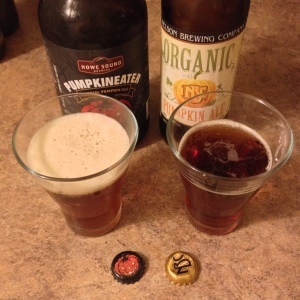 After all, if your pumpkin beer doesn’t taste of pumpkins, what’s the point? Phillips moves to round 2. Posted in Beer. Tagged 650mL, Fernie Brewing Co., Phillips, PUMPKINDROME. The muesli will not be competing in pumpkindrome. A year ago, around Thanksgiving, I got it in my head I wanted to try as many of the pumpkin beers at the BC Liquor Store as I could. After scouring the aisles, I took about five bottles up to the counter, feeling both pleased and a little over indulgent with so many beers on the counter before me. What a difference about 346 days makes. Have you been in a government liquor store lately? It’s like the Great Pumpkin went on some sort of bender. Orange everywhere. From Seattle to St-Ambroise, every craft brewery worth its stock is getting into the gourd game. Even Anheuser-Busch’s craft beer knockoff brand Shock Top had its own pumpkin wheat offering. I bet we’re two years away at most from Bud Light Pumpkin. So far this year, even though I’m only buying B.C. beers, I’ve amassed a collection of nine different brews, and been promised still more to come. With so many bottles and so little time before winter sets in, what’s a humble beer reviewer to do but make them fight to the death? Thus, I present Bad Rider’s first ever Pumpkin Madness Bracket. Every week, we’ll be pitting two brews against each other to see what combination of spice, squash and hops you should be cuddling up to during your annual leaf peeping trek. Each brew will get a couple rankings: Spiciness, actual pumpkin flavour (potentially a dicey category, given how many pumpkin spice products contain no pumpkin at all, but we’ll give it a go) and overall performance. Based on past experience, the best pumpkin beers balance both spice and gourd, but with some dark horses in this year’s line up who knows what we’ll find. Who will emerge victorious? Who will be crushed like a rotten Jack o’lantern on November 1st? The challenge begins next week..
*So far Kamloops only seems to have 9 B.C. pumpkin beers stocked in the entire city. While Bad Rider has several plans in the works, for now challenger 10 must remain a mystery of its own. Posted in Beer. Tagged PUMPKINDROME.